You inspire confidence. You have a fine sense of justice. You do everything in your power to keep the harmony and are even willing to sacrifice your personal desires for the good of others. You can take this too far, however, sometimes playing the role of the martyr. People see you as a maternal or paternal figure. They want to relax in your presence and unburden themselves. You are the safe port in the crowd. You are hospitable and domestic. You love children and are a good parent. You are romantic, faithful and very protective. 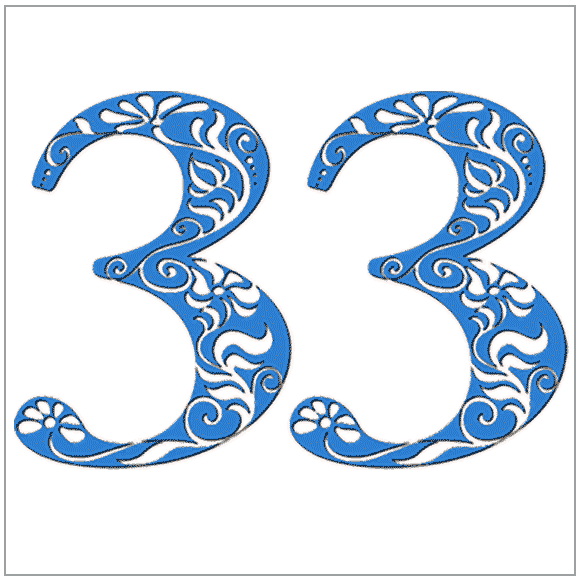 The 33 is also considered a Master number, although at its core it is a 6 (3+3=6). This gives you the potential to become a major influence on your community, most likely in politics or through a non-profit organization. This will be especially true after early middle age, at which time you gain an uncommon intuitive intelligence. Some of the world's greatest authors, poets, and comedians have a 33 Personality. You are artistic. You love music, flowers and gardening. You are a natural interior designer. You have an excellent sense of color and taste. You are more concerned with the content of your personality than your appearance, which causes you to be less conscious of the style of your clothes. You are more interested in comfort and the utility of clothing than the statement it makes. You are very vulnerable to praise and criticism. You tend to worry a lot, causing stomach problems. I would highly recommend Decoz's numerology reports. They are extremely fair priced, very accurate, and more complete than any other numerology reports I have seen. They are very detailed and in-depth and everyone who receives one is definitely pleased from first site of them. The numerology software is easy to use and works great.